Friday, Jan. 3, marked the 10th anniversary since the safe landing of NASA's renowned Spirit rover on the plains of Mars on Jan. 3, 2004. Spirit comprises one half of NASA's now legendary pair of Mars Exploration Rovers (MER). Opportunity, her twin sister landed, on the opposite side of the Red Planet three weeks later – on Jan. 24, 2004. The goal was to "follow the water" as a potential enabler for past Martian microbes if they ever existed. Exactly a decade ago, the famous robot survived the scorching atmospheric heating of the 6 minute plunge through the thin Martian atmosphere, bounced some two dozen times cocooned inside cushioning airbags, and gradually rolled to a stop inside 100 mile wide Gusev Crater. It was known as the "6 minutes of Terror". Before they were launched atop Delta II rockets in the summer of 2003 from Cape Canaveral, the dynamic, solar powered robo duo were expected to last a mere three months – with a 'warranty' of 90 Martian days (Sols). Spirit endured the utterly extreme Red Planet climate for more than six years. Altogether, Spirit drove 4.8 miles (7.73 kilometers),that's about 12 times more than the original goal set for the mission. She transmitted over 124,000 images. Eventually she drove back down the hill and made even greater scientific discoveries in the area known as 'Home Plate'. Spirit survived three harsh Martian winters and only succumbed to the Antarctic-like temperatures when she unexpectedly became mired in an unseen sand trap driving beside an ancient volcanic feature named 'Home Plate' that prevented the solar arrays from generating life giving power to safeguard critical electronic and computer components. 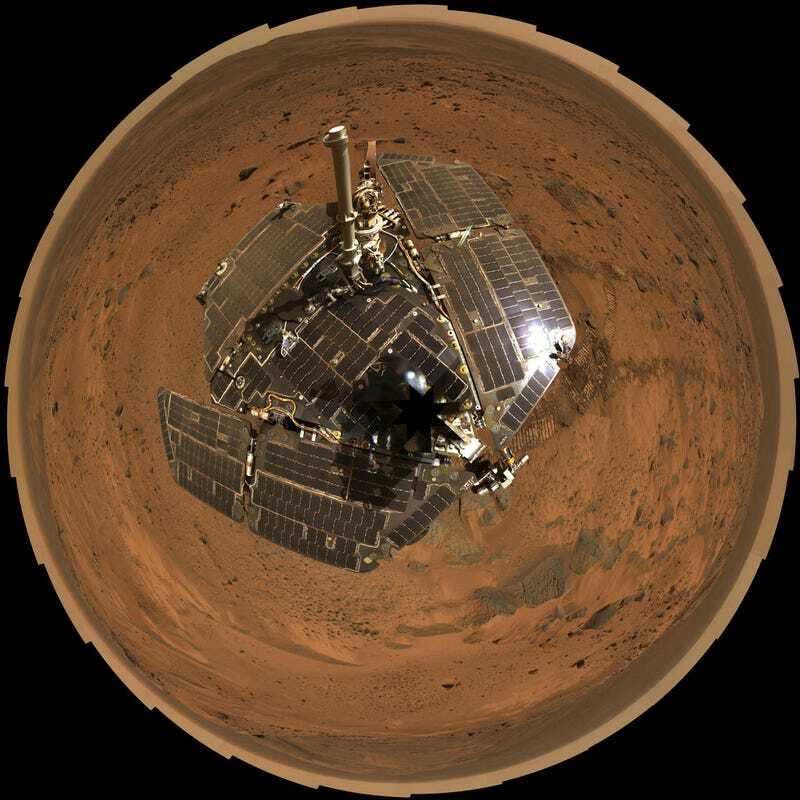 In 2007, Spirit made one of the key discoveries of the mission at 'Home Plate' when her stuck right front wheel churned up a trench of bright Martian soil that exposed a patch of nearly pure silica, which was formed in a watery hot spring or volcanic environment. Spirit was heading towards another pair of volcanic objects named 'von Braun' and 'Goddard' and came within just a few hundred feet when she died in the sand trap. "In the Columbia Hills, we discovered compelling evidence of an ancient Mars that was a hot, wet, violent place, with volcanic explosions, hydrothermal activity, steam vents — nothing like Mars today. "When Opportunity got to the rim of Endeavour Crater, we began a whole new mission. We found gypsum veins and a rich concentration of clay minerals. The clay minerals tell us about water chemistry that was neutral, instead of acidic — more favorable for microbial life, if any ever began on Mars." Meanwhile, NASA's new Curiosity rover just celebrated 500 Sols on Mars and is speeding towards Mount Sharp from inside Gale Crater – which is about the same size as Gusev crater. And a pair of newly launched orbiters are streaking to the Red Planet; NASA's MAVEN and India's MOM. And China's new Yutu lunar rover and Chang'e-3 lander are napping through the lunar night until mid-January.